As a growing boy living in Hiroshima, there’s one thing that gets me excited above all else: food. Since coming to Japan in January one of the first things I wanted to get sorted was where to find some cheap, affordable, and tasty food. In the past few months, while still on the hunt for some solid grub, I noticed one thing that I found pretty peculiar; Hiroshima seemed to have substantially more fresh food than almost any other place I have ever traveled to… I decided to inquire further. My first stop in my search for answers was my most frequently utilized source of calories: Coco. As it’s located near our hotel, this national chain is, without a doubt, one of our most visited convenience store. After chatting with the manager for just a few minutes, I was immediately hooked by what he had to say. As it turns out, he has worked at Coco for nearly 20 years and claims to sometimes work 18 to 22 hour shifts. Absolutely nuts! We talked about how his business changes throughout the seasons and some of the changes he’s had to make to stay afloat so long. He told me it was a careful balance between carrying international goods and maintaining a local atmosphere. What I didn’t know was that their bento boxes and lunch food was entirely fresh and made right there at the store. Not only that, but also their entire baked goods section was freshly made every morning. Interesting. While talking with him was fascinating, there was still much more I wanted to know. So, next, I ventured across the street to a local Japanese grocery store. When entering this little market, the pungent odor of fish is remarkable. A quick look around the shop made it very apparent to me that this was a very local store – exactly what I wanted. While conversing with the manager, I was shown around the shop. It was like being on a mini Japanese safari. Here are a few things I discovered. Firstly, people in Hiroshima love baseball; baseball was one of the biggest topics of discussion during this interview and there were a few Carp (Hiroshima’s baseball team) food and trinkets scattered around the store. Second, fish is a very important facet of Hiroshima’s residents’ diets. 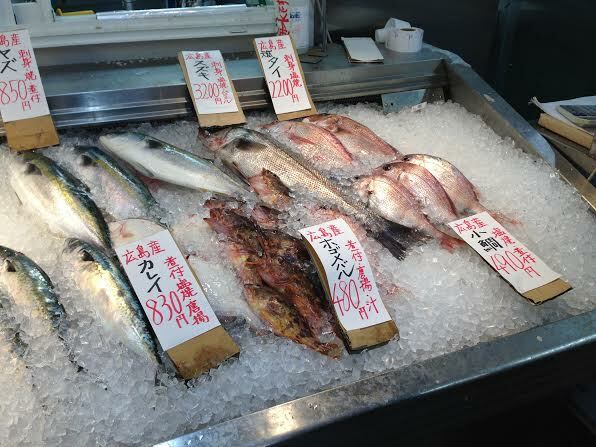 All the fish was freshly caught and prepared for their eager customers. Once again here was the idea of fresh food. From fresh produce to bread to fish, it seemed that everywhere I looked, the most prized aspect of grocery stores across the city was its freshness. After visiting a national chain, then a local store, I decided to get the final angle from Hiroshima’s latest multi-national chains: Costco. Again, I spoke with the manager, this time completely in English. With easier communication came some interesting statistics. Normally, in a typical Costco, fresh produce accounts for 6% of the stores total sales. In Hiroshima, it accounts for 10%. Hmm… so this is something that they have realized on a corporate scale too. In an average Costco, fresh breads are only 2% of sales, while in Hiroshima fresh bread is 10%; even Costco realizes that Hiroshima loves fresh food! Very, very interesting. 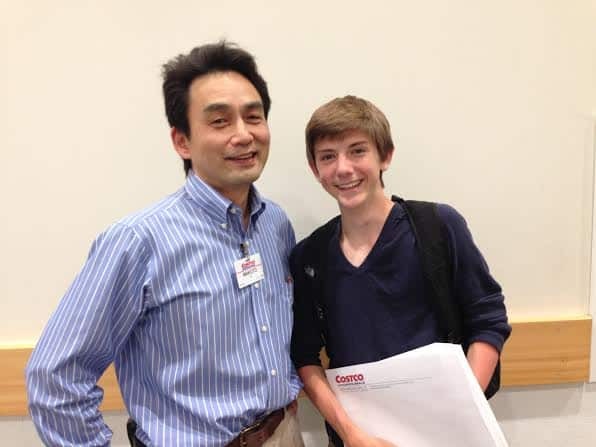 I was so glad to realize that my original hypothesis was not just the observation of a 15-year-old American, and that instead this theory is something that has been supported by local, national, and international shops here. I’m so glad to live in a city where freshness and quality is such a priority. We are also very lucky to live in a city with so many warm, welcoming people who are so kind to curious foreigners. I definitely recommend to anyone visiting or living here to start asking questions about Japan and its fascinating culture. I have only ever been met by smiles and very interesting answers, as I’m sure you will also discover! 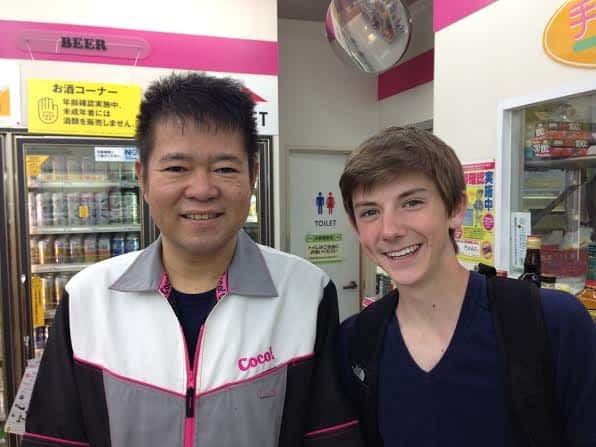 Grant, I love the advice to talk to people and ask any questions you have about anything while in Hiroshima- I have also met so many interesting and hardworking people here who appreciate anyone showing an interest. Yes, I love the fresh food emphasis that Japanese people have. I think it maybe the secret behind their clear and smooth skin! Thanks for the tips on fresh food. I’m going to try shopping at Coco next time I get to visit Hiroshima.